Photographer Andrew Boyle spent three years photographing and interviewing the cosplayers at New York City’s Comic-Con for this book. The result is a fun picture book showcasing some amazing costuming talent. 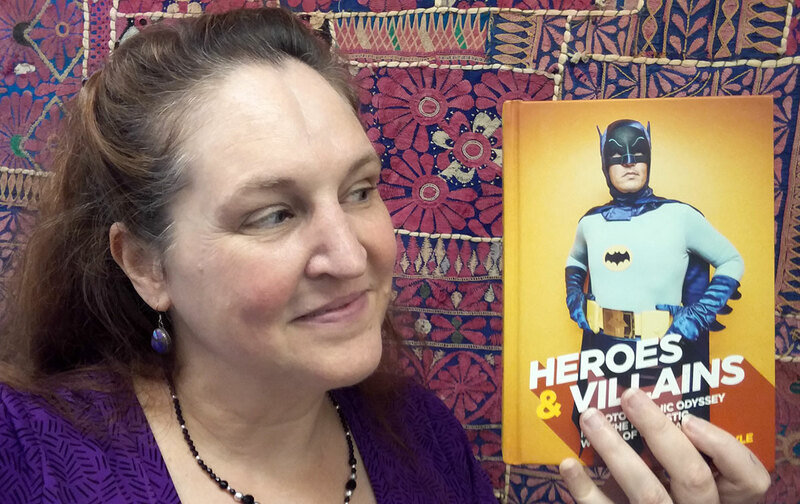 Heroes & Villains is basically a picture book with pages and pages of photographs of cosplayers in their elaborate costumes. Some are accurate reproductions of film, TV and comic book characters, others are the cosplayer’s interpretation, reimagining or own creation. Either way, the craftsmanship that goes into these costumes shows. Simply this: Full color photos showcasing talented costume artists. I really enjoy flipping through the book and seeing the creativity of this cosplayers. It is obvious they are passionate about their work and their favorite characters. I also enjoyed the interesting mashup and re-imagined costumes. Some of the costumes are so good, you’d think they came right out of the movies. In fact, when I first saw the cover, I thought it was Adam West, until I noticed the jaw line wasn’t right. I also enjoyed the quotes from some of the cosplayers that is sprinkled about the book. The size of the book is so small — only 5.8 x 1.2 x 8.2 inches — which means you have to hold the book open with two hands. I think a slightly larger size would have showcased the images better and would have been easier to leaf through. I could easily see this book inspiring future cosplayers. So why not add in a resource section that would help these readers start creating costumes of their own? Maybe even add in some advice from the cosplayers pictured, too. This is a nice, compact coffee table book. If you enjoy costuming, then this book could give you hours of enjoyment.